On many Fridays throughout the summer, the smell of grilled hot dogs and hamburgers waft from outside a hangar at Frederick Municipal Airport. 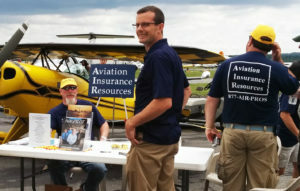 People gather around chairs and talk aviation next to a white golf cart with a large sign on the back displaying the Aviation Insurance Resources (AIR) logo. The crowd consists of coworkers, family, friends and clients. An aviation insurance brokerage working under the tagline “Pilots Protecting Pilots”, AIR is a company founded by pilots passionate about the industry they serve. AIR founder Jon Harden’s first flight was a unique one. As a young boy he departed Wisconsin’s frozen Lake Eau Claire in a Piper Cub on skis. Piloted by a family friend, Wally Shong, Harden was hooked and became determined to fly! After college, he fulfilled his dream of becoming a pilot. With that box checked off, the next on his to-do list was to find a job in aviation. That goal would lead him to a career at direct aviation underwriter, Avemco, for 17 years. While he was serving as vice president of sales, Avemco began corporate restructuring and he was one of the first to be let go. “It was a complete surprise to be fired. But looking back, it was a real blessing, too,” he explained. It was this firing that led Harden to start his own aviation insurance brokerage, but he could not do it alone. Drawing from the remarkable talent that Avemco had let go, he had one firm rule for the agents in his office: they must be pilots. His first choice was Chris Wolbert, an Embry Riddle graduate who is a commercial and multi engine rated pilot who has been flying since 1990. Chris was excited to pursue a career with “true aviation people”. Together, the two formed Aviation Insurance Resources, one of the most competitive insurance brokers in the business. “One thing I’ve quickly learned from my clients is to listen to their individual needs, so I can set up a policy specifically for them,” he explained. The company would quickly grow, adding agents all with a breadth of aviation experience as well as remote offices throughout the country to better serve their clients. AIR agents work aggressively to stay on top of the most current needs of the aviation industry. When the Light Sport Aircraft (LSA) category unfolded in 2004, AIR was the first to work closely with aviation underwriters to structure policies for this new type of aircraft. Companies using Unmanned Aerial Vehicle (UAVs) also showed new growth potential. 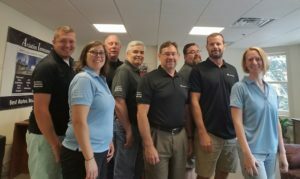 When drone insurance was a relatively new concept, AIR agent Patrick Smith quickly jumped in to learn as much as he could about the needs of UAV operators. “The regulations on UAVs are constantly changing, and the needs of our clients are adapting. We make the insurance process easy for drone operators and even offer a way to quote and begin coverage completely online,” he explained. When not in the office, AIR agents still live and breathe their passion for aviation. 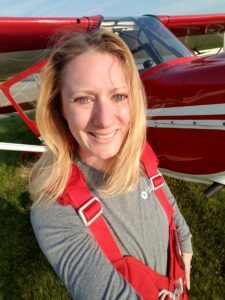 For example, AIR agent and commercial pilot, Victoria Neuville, is a co-host on the popular podcast, The Stuck Mic AvCast, that draws in around 10,000 downloads on iTunes each month. In addition, she performs outreach teaching kids about aviation through her children’s books series, Turbo the Flying Dog. Victoria thanks her father for her addiction to aviation as does agent Jon Shimer. To date, Jon has flown over 65 different models of aircraft. He’s owned a Pitts Special and a J-3 Cub. 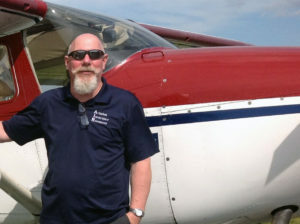 Most recently, he’s created a program to help members of the Cub Club receive lower rates on their aircraft insurance. Beyond flying experience, AIR agents bring years of insurance knowledge to the table. For example, commercial pilot Bill Snead joined the AIR team with over 35 years in the aviation insurance industry! This knowledge, paired with the fact that AIR works with all the major aviation insurance markets to provide their customers with the most competitive rates and broadest coverage available. John Sweeney’s first job was as an aviation claims adjuster. Years later, that experience serves him well as an agent for AIR. With 18 insurance markets vying for a small slice of business, competition drives the rates down, benefiting the consumer. Other insurance brokers can just offer a handful of quote options, whereas AIR’s integrity is known throughout the industry and therefore able to be appointed by all markets. Harden promises you will never call AIR and listen to a list of options before speaking to an agent. An actual human will answer the phone every time. Long-time AIR clients may recall AIR’s initial motto, “Service with integrity from the professionals you know and trust” still rings true today. Carrie Marsh never expected to leave the mortgage industry and take on the field of aviation. But when she was looking for something new, her pilot mother-in-law pointed her in the direction of Aviation Insurance Resources (AIR). Carrie can often be found at her mother-in-law’s hangar along with her young son, Jude. Her favorite flight was in a King Air during sunset and Jude was elated to fly in a larger aircraft. AIR has been presented with insurance opportunities outside of the aviation industry such as auto or marine, but Harden continues to resist adding other lines. “We’re committed to aviation. That’s our expertise and will remain our sole focus,” he said. That commitment to serving aviation spans many aspects of the community to include: personal aircraft owners, corporate aircraft owners, renters, FBOs, flight schools, charter, premises, products, hangar keepers, workers compensation, hangars, UAVs and more! However you are involved in the aviation industry, AIR is dedicated to writing the appropriate insurance solution for your aviation risk. 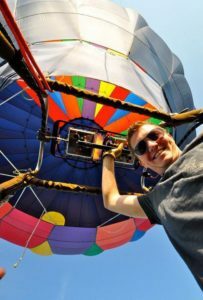 PreviousPrevious post:Memories from AirVentures PastNextNext post:The Most Amazing Avionics Shop!